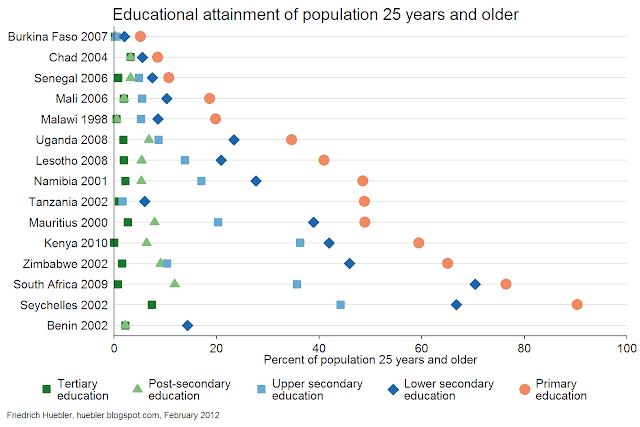 The educational attainment of a country's adult population reflects long-run trends in participation in primary, secondary and post-secondary education. Educational attainment is a measure of human capital - the skills and competencies of the population - and thus an indicator of a country's potential for economic growth. Educational attainment is also closely linked to health, political participation, and other indicators of social development. Compared to other regions, educational attainment in sub-Saharan Africa is relatively low but there are large variations between individual countries. The graph and table below present data from the UNESCO Institute for Statistics (UIS), published in the Global Education Digest 2011. The values for each country indicate which percentage of the population aged 25 years and older completed at least primary, lower secondary, upper secondary, post-secondary, or tertiary education. For example, in Seychelles, 90% of the adult population completed at least primary education, 67% at least lower secondary education, and 44% at least upper secondary education. At the other end of the distribution is Burkina Faso, where only 5% of the adult population completed at least primary education and only 2% at least lower secondary education. Source: UNESCO Institute for Statistics, Global Education Digest 2011, Table 19. - Click image to enlarge. Among the 15 countries in sub-Saharan Africa for which UIS has data, only seven - Kenya, Mauritius, Namibia, Seychelles, South Africa, Tanzania, and Zimbabwe - have attainment rates for primary education at or above 50%. In the remaining eight countries with data - Benin, Burkina Faso, Chad, Lesotho, Malawi, Mali, Senegal, and Uganda - less than half of the population 25 years and older completed at least primary education. For Benin, the share of the population with completed primary education is unknown because the country reported combined figures for incomplete and complete primary education; 16% of the population attended primary education with or without completing that level (see Global Education Digest 2011, Table 18). Similar to the attainment rates for primary education, attainment rates for other levels of education also vary widely between individual countries. The proportion of the population that completed at least lower secondary education ranges from 2% in Burkina Faso to 70% in South Africa. For upper secondary education, the attainment rates range from 0.5% in Burkina Faso to 44% in Seychelles. Not more than 0.5% of the adult population completed post-secondary education in Burkina Faso and Malawi, compared to 12% in South Africa. Completed tertiary education is uncommon among the population 25 years and older in sub-Saharan Africa. Only one country, Seychelles, has an attainment rate for tertiary education greater than 3%. Source: UNESCO Institute for Statistics, Global Education Digest 2011, Table 19. When interpreting the educational attainment data for sub-Saharan Africa it is necessary to consider that the reported values for some countries are more than a decade old. As younger, more educated cohorts reach age 25, the average attainment rates of the population 25 years and older increase and the situation of some countries is therefore likely to have improved since the year of reporting. In addition, the picture is incomplete because for 30 of the 45 countries in the sub-Saharan Africa region, as defined by UIS, no educational attainment data is available in the UIS Data Centre.